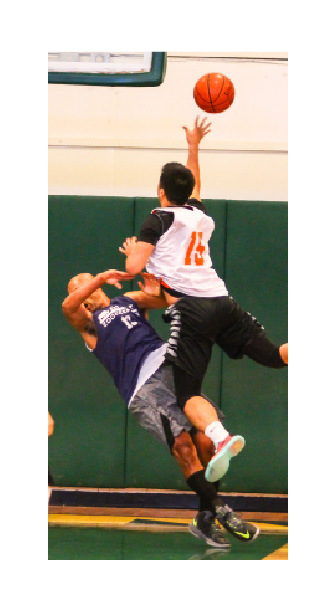 DALY CITY.—The Nisei Athletic Union State Championship games were played Sunday, April 26 at Westmoor High School. Foster City Flyers claimed the Aye Plus title as FOR NTO declared the game. NC’s Rockets captured the crown in Aye Major and SC’s Mavericks triumphed in Aye Minor. Looking more like the home team than the visitors, Mavericks bottled up the San Francisco Drakes, 92-76. The opening 7m. saw the two teams ease into the contest. Both teams attempted 11 shots, Mavs hitting 4 and SF 3. Over the next 7:30, the visitors found their rhythm, making 11 of 13 shots while forcing 5 Drake turnovers and 2 of 5 shooting. Jay Suminaga converted a rebound, and after a steal and miss, Andrew Olson grabbed the carom and scored. Kevin Masuyama hit from 4 feet beyond the arc, then Eric Wun turned a steal into a layup. Alan Morris hit two fts, then a baseline jumper and Masuyama hit a second trey. E. Wun finished off a drive for a 28-12 score. Justin Sam ended the 16-point run with a triple from the wing for SF. J. Suminaga answered with a layup but J. Sam’s drive matched it. Masuyama hit his third consecutive trey fron 22’ then stole the ball. Morris hits from the baseline again and Ryan Wun’s triple opened a 38-17 Maverick lead. Drakes steadied themselves to keep pace for the next 3m. Then the Northern Cal champs increased the pressure on defense and pushed the pace. Their top gun Max Sugaya finished a break for a deuce, Drian Sam tripled, Chris Lee drove on another break and as the clock ran out, Sugaya nailed a 28-footer, closing the gap to 53-40 at half. As the second period opened, Mavericks and Drakes traded points until the 14:40 mark and a 61-50 score. Mavericks took advantage of 3 turnovers and 2 for 10 Drake shooting to open a 76-56 lead at the 7:35 mark. Morris worked the key and backboards for 9 of his total during this run. Sugaya, who scored 34 in the game on 11 for 23 shooting, tried to rally SF, but Mavs controlled the tempo, hitting some layups and fts to lock up the win. Morris was named MVP, scoring 28 points, grabbing 14 rebounds and blocking two shots. 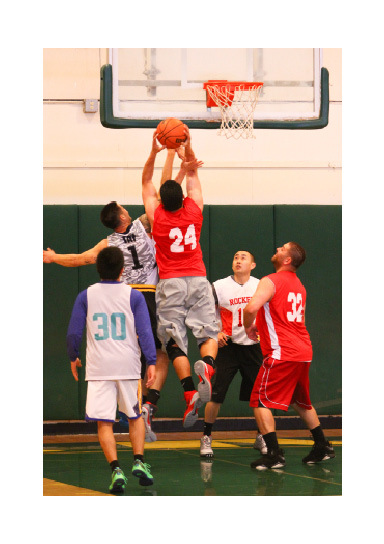 Masuyama and E. Wun were his capable wingmen, accumulating 22 and 21 points respectively, while helping on the boards. The younger legs of Rockets wore down The Boyz Entourage, 78-65. The two teams came out playing hard and effective. After 5:00m., Boyz ran off 11 consecutive points, turning a 2-point lead into a 26-15 advantage. Jon Chow and Sean Stroud led the charge. From the 11m. to the 5m. mark, neither team could find the range. Eric Lee made a trey from the corner and Rockets upped the tempo, taking quick shots. Taylor Takahashi added two more triples, closing to 33-32. In the final minute of the half, Stroud worked the low post and Chow hit two fts to slow Rockets down but T. Takahashi tipped in a deuce with 1s. left. The half ended with Boyz leading 37-34. Entourage decided to work Stroud at the low post and midrange. He had 12 touches in Boyz’ first 16 possessions, scoring 9 of his total. Rockets countered as T. Takahashi defended Stroud, usually without help. On the offensive end, Rockets ran the break or penetrated with kick-out passes. With Boyz leading 52-51, T. Takahashi nailed a triple off an assist from Kyle Takahashi. Two more possessions, and T. Takahashi connected two more times. Rockets were in front, 60-55, with 9:30 remaining. Both teams shotmaking slowed. With the score 65-60, Rockets converted on key possessions. Follwing a long rebound, K. Takahashi sank a jumper from the free throw line. A minute later, Dwight Tanaka sank a triple from the top of the key and Rockets led, 70-60, with 3:38 left. Boyz looked tired but gamely played on. Two teardrops by Tanaka on back-to-back possessions had Rockets ahead, 74-62 with 1:28 to play. For the game, Stroud gathered in 20 rebounds and added 23 points. Chow scored 26 to lead Boyz. For his sharpshooting and defense, T. Takahashi was selected MVP. Teammates Tanaka scored 20 and K. Takahashi made 14. Foster City Flyers outlasted the outnumbered Westside Lions, 85-80.Flyers came out playing tight man defense, giving up height at most positions. Westsiders, who made the trip to San Francisco on two days notice, set up in an uncharacteristic 2-1-2 zone.The game was wide open. Brandon Yamauchi’s three-point shooting keyed a 10-zip run to open a 30-16 lead.Robert Reynolds found a hot hand and Lions charged back to trail 35-30. FC’s Tyler Petroni met the challenge and Flyers reopened their lead to 50-38. Less than 4m. into the second half, Westside was down to four players. Kurashiga, T. Petroni and Scott Kurashige capitalized and midway through the period, Foster City opened a 70-53 advantage. 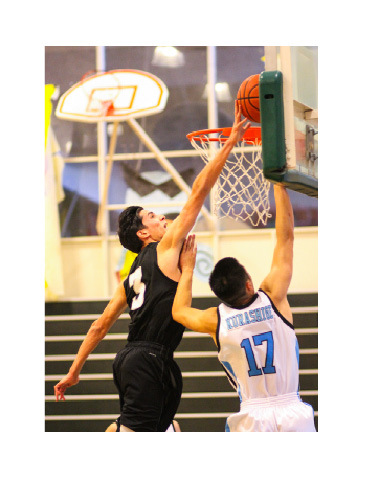 Derek Wong and Dominic Tejo rallied Lions and they chopped down the Flyer lead. With 5:50 left, it was down to 3 points, 72-69. T. Petroni sank a trey from the wing and worked the key for a lay-in and a 79-71 lead. Wong and Reynolds both nailed triples. When Reynolds sank two fts, Flyers’ lead was 79-77. Ryan Sera’s drive made it 81-77, but Wong’s bomb with 1:35 remaining closed the gap to 81-80. T. Petroni powered for a hoop and with 28s. left, Sera hit two fts for the final score. Reynolds, Wong and Tejo scored 31, 21 and 16 points for Lions. Tejo grabbed 18 rebounds and blocked 7 shots. Petroni was selected the game’s MVP. He led Flyers with 28 points, 16 boards and 3 blocks. Yamauchi added 19, Sera 13 and James Watanabe 10.